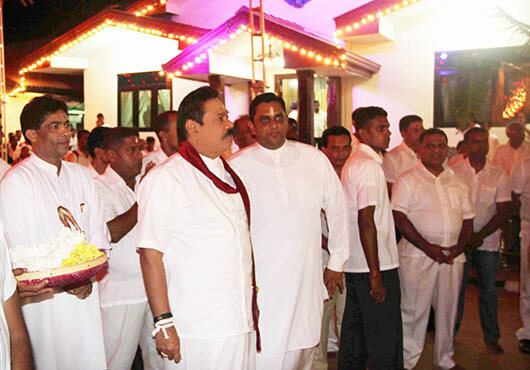 President Mahinda Rajapaksa visited the Kataragama sacred area last night and participated in many special religious observances and annual Kataragama perahara festival. The President participated in religious observances at the Katharagama Kiri Vehera Rajamaha Viharaya and called on the Chief Incumbent of the Kiri Vehera and the Chancellor of the Uva University Ven. Dr. Aluthweva Soratha Thera. A pirith chanting ceremony also took place to invoke blessings on the President. Thereafter he attended a Bodhi Pooja and other religious observances at the ‘Ashta-Pala-Bodhi’. 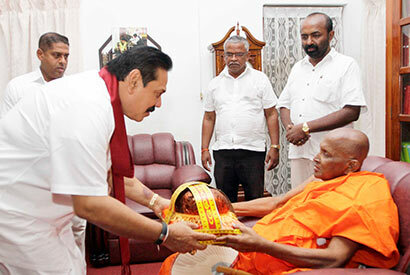 President Rajapaksa then paid obeisance at the Ganadevi Kovil and the Kataragama Maha Devala and secured blessings. 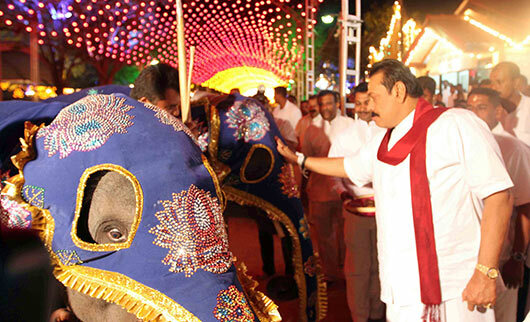 Later the President participated in the commencement of the Esala Perahera. A number of special rituals related to the historic Kataragama Esala perahara that are believed to have been performed since Great King Dutugemunu’s era took place. The President offered floral tributes to the perahara casket of relics that was carried by Vasana the tusker and secured blessings. After garlanding the casket the annual Esala Perahera of the Ruhunu Kataragama Devalaya took to the streets. Meanwhile the tusks believed to be of Kandula, King Dutugemunu’s elephant were also paraded in the perahara. Chief Minister of the Uva Province and the Basnayaka Nilame (Chief Custodian) of the Kataragama Devalaya, Shashendra Rajapaksa led the Perahera. 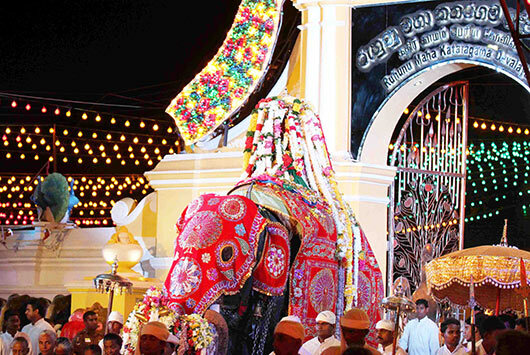 The perahara entered from the main Wahalkada of the Kataragama Devalaya and paraded the streets and reached the Walli-Amman Devalaya. After the conduct of religious rites, the Perahera then made it back to the Ruhunu Kataragama Maha Devalaya. Upcountry, low country and Sabaragamuwa Dancing were among the cultural features which added colour and glamour to the perahara. Maha Sangha headed by Venerable Dr Aluthwewa Soratha Nayaka Thero, many Parliamentarians and local politicians were present at the occasion. Thousands of devotees and local and foreign spectators flocked to Kataragama from all the corners to witness one of the country’s best-known religious pageants.